The Janssen de Jong Caribbean companies complement each other in their different fields of expertise. The individual companies operate as separate strong units within the Caribbean group; however they rely on a group-wide knowledge-pool to tackle any challenges faced. The group collaborations have included some milestones on each of the islands on which the group is active. 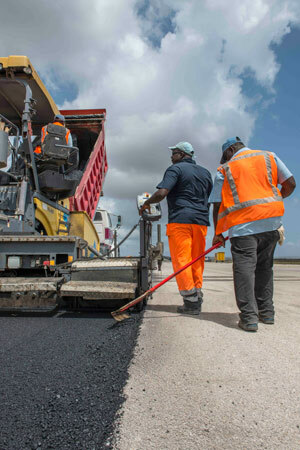 The companies of Janssen de Jong Caribbean are active in infrastructural development, maritime and civil construction, housing and other commercial construction developments, property development, the extraction of raw materials and production of building materials. The Caribbean group has a business direction that is a collective goal for Janssen de Jong Caribbean. Execution thereof lies with the different companies that formulate how to attain these goals within their own companies and business plans. The company management teams annually review the business plans, and update on progress, especially considering some of the lengthy projects the companies have overseen and completed over the last 5 decades. Quality benefits from the alliance, within a group that is so demanding to one another. The fact that the companies are seen under one umbrella is an inevitable perception. That is why each company within the group is still a very strong and integrated chain to the outsider. Staff exchange has also proven very effective for the companies. When the essence of the companies’ core values basically remains the same a (temporary) transition is easily achieved. Janssen de Jong understands the value of its employees, and is always investing in personal growth. Janssen de Jong Caribbean has claimed a position in the region, but is continuously striving for more. With a strong synergy between the companies the feasibility to continue to achieve even bigger projects is certainly possible. Company procedures are regularly evaluated and the objective is to obtain and have all companies ISO certified. *Did you know? The potential of Curacao for Janssen de Jong was discovered on their first overseas project in Haiti. The Haiti infrastructure project included a boatload of Dutch men coming to Haiti to build roads, which didn’t all quite go according to plan!